Former Fed governor Kevin Warsh warned on Thursday that the US-China relationship is "probably as poor as" it has ever been since former President Richard Nixon and Henry Kissinger developed strategic relations between both countries in the early 1970s. "We're at the risk of a real cold war" between the world's two largest economies, said Warsh who had been on President Trump's list for Fed chairman before Jerome Powell was chosen. "The last 30 years we've been living and breathing globalization as if it's an inevitable force," but now, it seems the six-decade-long bubble has finally popped. 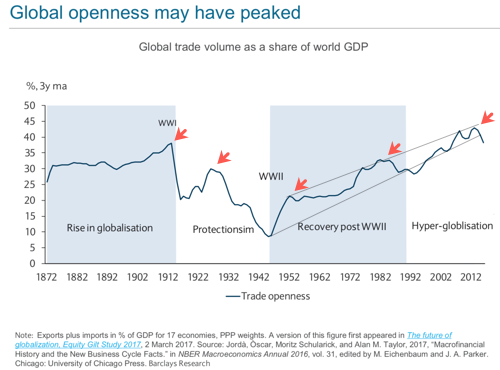 Bank of Americas says trade wars and deteriorating relations with China have been some of the reasons for the decline in globalism. Especially, US tariff duties collected, % of total imports have surged under the Trump administration. "Protectionism has cross-party support in the US, and nationalist parties continue to gain in Europe. 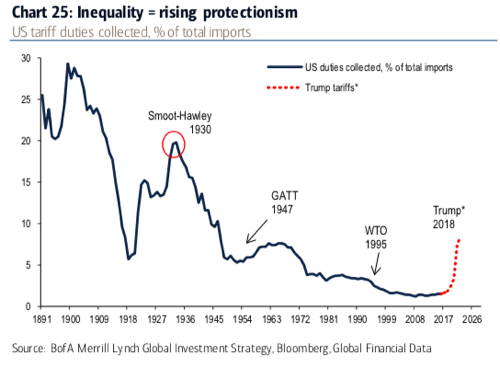 Further action on China ($200bn), autos ($350bn), NAFTA ($690bn) could raise US tariff revenue as % total imports to levels not seen since 1946," said BofA. During the CNBC interview, Wash used the term "cold war" to describe the economic standoff, not the decades-long "mutually assured destruction" nuclear stalemate with Russia. "We are probably on the precipice of a brand new relationship with the Chinese," Wash told CNBC. He asked: "Could we be at the beginning of a 10- or 20-year cold war?" If so, an economic cold war between the countries could have major implications for the global economy like causing a global growth scare and repricing risk assets. The return of a bipolar world: "Five or 10 years from now we might see two poles: a Chinese-centric world and an American-centric world. And the [other global] economies and countries will have to plug into one or both," he said. "Great power relationships are not about how many soybeans you're going to buy [or how] many Boeing airplanes you're going to buy. It's about your core interests," he added. "I suspect that there will need to be between [Chinese President Xi Jinping] and President Trump a great summit, among great powers. 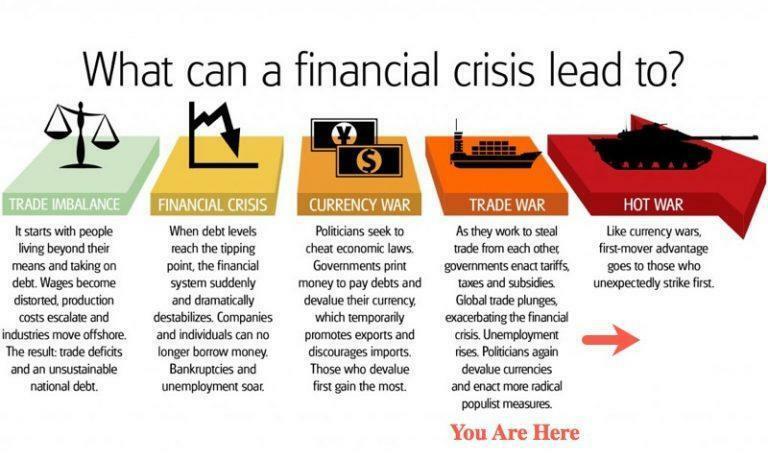 And that requires two countries that want to have that discussion," said Warsh, who was a Fed governor during and in the aftermath of the 2008 financial crisis. While Wash made no reference about a military "cold war" between the countries in the CNBC interview, it is likely that a continued breakdown in US-China relations will likely transform into a new arms race starting in the early 2020s. "Trade war should be recognized for what it is...1st stage of a new arms race between the US & China to reach national superiority in technology over long-term via Quantum Computing, Artificial Intelligence, Electronic Vehicles, Robotics, and Cyber-Security. China strategy to ensure that 40% of China’s mobile phone chips, 70% of industrial robots, 80% of renewable energy equipment are “Made in China” by 2025. China First strategy will be met head-on by an America First strategy. 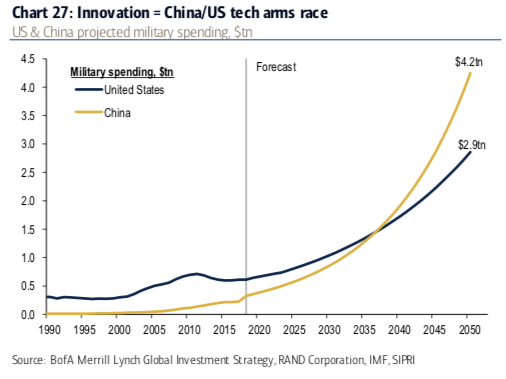 Note military spending by the US and China is forecast by the IMF to rise substantially in coming decades, to $4tn in China & $3tn in the US," said Bank of America. With the threat of a full-blown trade war in 2019, and relations between both economic superpowers to worsen. It is only a matter of time before a hot war develops.